Published: Dec. 1, 2012 at 04:21 p.m. Updated: Dec. 1, 2012 at 11:38 p.m. 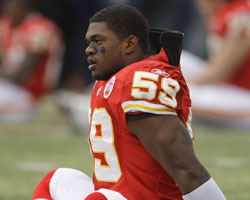 The shocking suicide of Kansas City Chiefs linebacker Jovan Belcher after he killed his girlfriend in a separate shooting is such a difficult story to digest, even from far away. For Chiefs general manager Scott Pioli and coach Romeo Crennel, whom police said witnessed the shooting, Saturday's tragedy will be a life-changing event. Police said Belcher thanked Pioli and Crennel for all they had done for him before taking his own life. Kansas City mayor Sly James spoke with Pioli on Saturday and said the GM was "very emotional about this." "I can tell you that you have absolutely no idea of what it's like to see somebody kill themselves," James said, via Jeff Passan of Yahoo! Sports. "If you can take your worst nightmare and then put somebody you know and love into that situation and give them a gun and stand 3 feet away from them and watch them kill themselves, that's what it's like. It's unfathomable. It's something that you would love to wash away from your mind, but you can't do it. There's nothing like it. There's nothing like it. Think about your worst nightmare and multiply by five." The Chiefs announced Saturday afternoon that the team would play its game against the Carolina Panthers as scheduled. "After discussions between the league office, head coach Romeo Crennel and Chiefs team captains, the Chiefs advised the NFL that it will play tomorrow's game vs. the Carolina Panthers at its originally scheduled time," the Chiefs announced in a statement. James helped provide the team's reasoning to play in his statements to the media. "I think that they believe there's an obligation to the people of this city and the fans of this team and the fans of the other team to proceed and go forward," James said. "Scott is extremely concerned about making sure the fans of this team are not disappointed or left out in the cold by any decision they make. He's trying to do what's right."